The monthly subscription box trend shows no signs of slowing down anytime soon, with new boxes constantly popping up on the market. BodyMonth is one of the latest kids on the block. As well as blogging on here, some of you already know that I'm a regular contributor to All Subscription Boxes (a fab website that's updated constantly with new subscription box reviews), so I've had the pleasure of trying out a lot of different boxes over the years. 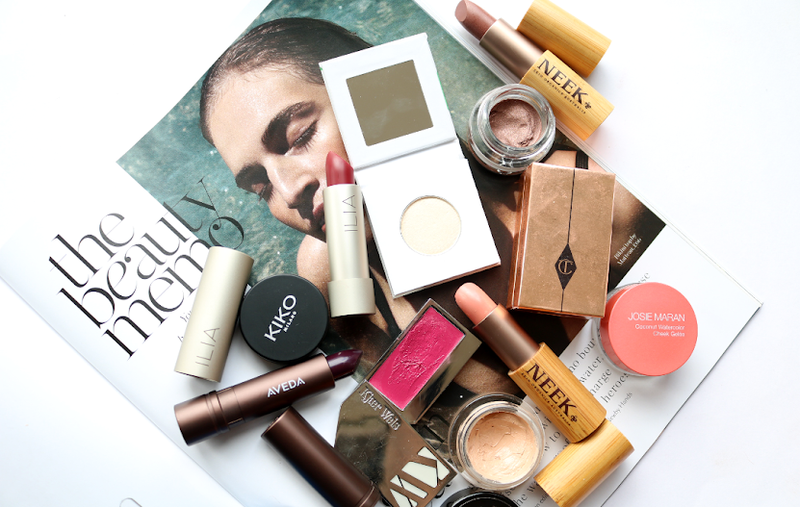 In the beauty box world, I've felt that no-one's really done a box focused on just 'basic, everyday essentials', as most beauty boxes focus on samples and travel sizes of higher end/luxury brands. BodyMonth have obviously seen this gap in the market too, as they launched their Body Care Subscription Box service back in August. 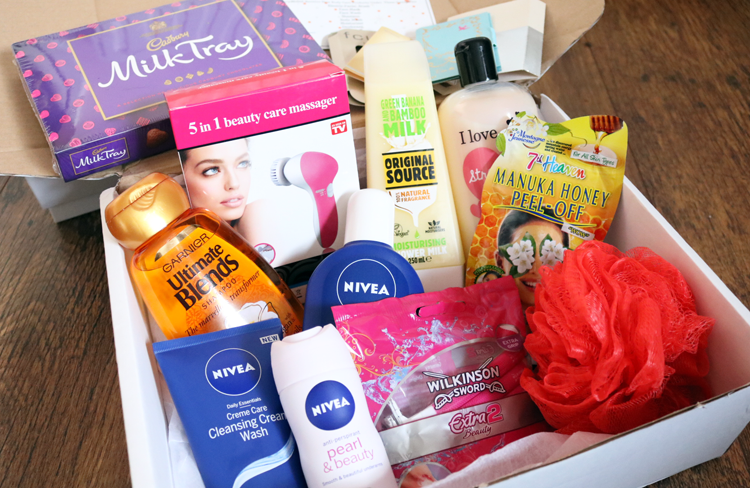 It's basically like your own personal care package that contains toiletries that you'd use on a daily / regular basis, with everything being full size, and the products are all from well known, affordable, high street brands. 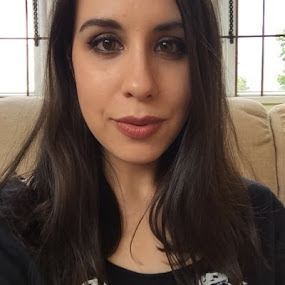 Now I have to be honest here, whilst I enjoy a good handful of budget favourites every now and again, I am a bit of a luxury, pampering Princess, and combined with my love of more natural and organic stuff, a couple of the products in BodyMonth are by brands that I wouldn't really use for myself. 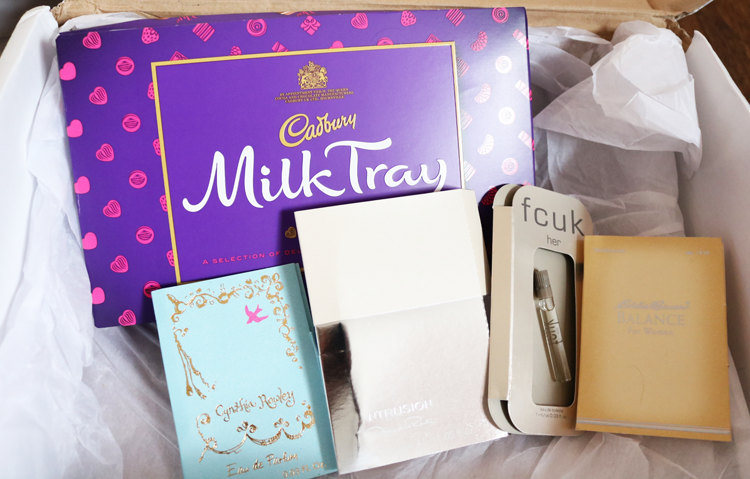 However, there are some which I do love, and I wanted to include a review of their box to showcase the variety of beauty boxes that are available out there. 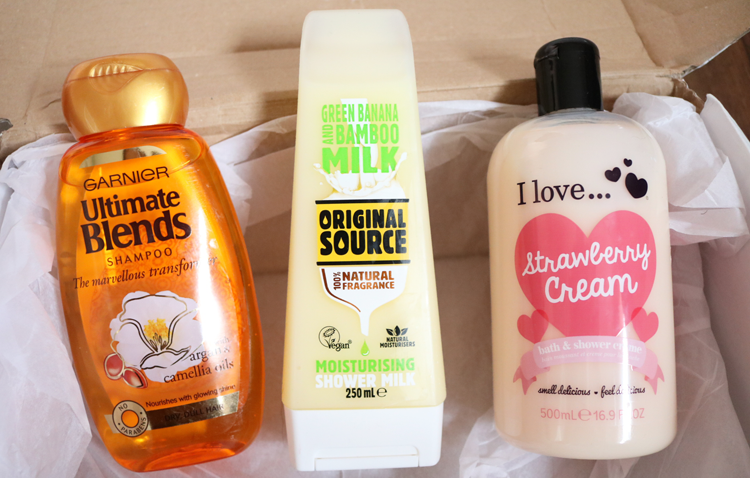 Garnier Ultimate Blends Shampoo (RRP £3.89) / Original Source Green Banana and Bamboo Milk Moisturising Shower Milk (RRP £1.80) / I Love... Strawberry Cream Bath & Shower Creme (RRP £2.99). Sadly I can't use the shampoo as it has SLS in it, but my sister is a big fan of this range and says that it works well for her dry hair so I'll definitely be passing it onto her. I love Original Source shower gels so I'm excited to be trying out this new Shower Milk - despite my sensitive skin not getting on with SLS, I can happily use Original Source, LUSH and some Treacle Moon products without any problems - odd no?! I haven't used anything from I Love... before, but this Strawberry Cream flavour smells just like a milkshake, mmmm! 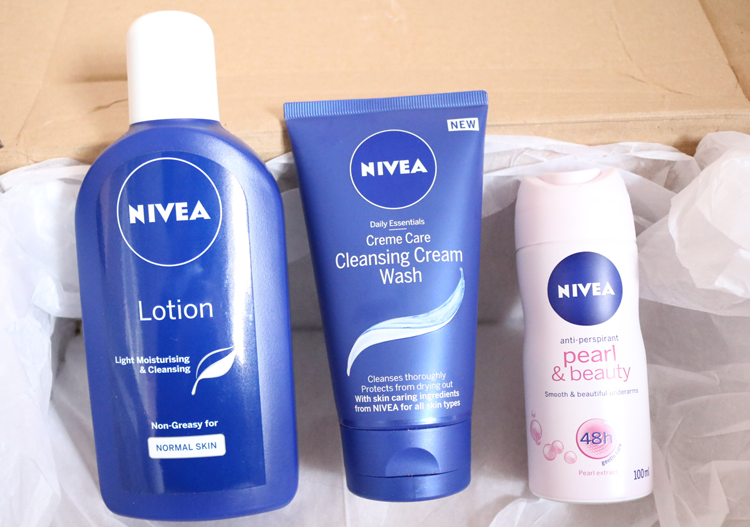 Nivea are a brand that I don't personally use, however my mum will be more than happy to take these off my hands. I like how BodyMonth have included a bit of everything in the box - shampoo, shower gel, bubble bath, body moisturiser, face wash, deodorant etc - it's definitely got you covered on the everyday toiletries front. When you subscribe to BodyMonth, they include an Electric Facial Brush in your first box which is this 5-in-1 Beauty Care Massager. It doesn't appear to be from a branded / well known company, but I've found similar on eBay and Amazon for around £4. It comes with five changeable heads and you can use it all over your body including the face. I quite like the look of the pumice stone head for softening dry feet, and there's a soft sponge head that looks useful for removing makeup with. 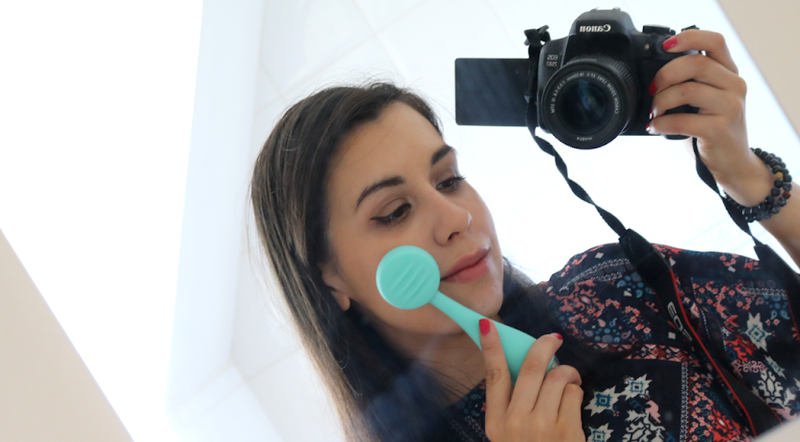 I love getting face masks in beauty boxes and I've used this one from 7th Heaven before - a great budget buy that you can pick up in most places for just £1! Razors always come in handy and are something that I often forget to pick up when I'm doing a toiletries shop, so it's really good to see a pack included in the box. When you sign up to BodyMonth, you fill out a brief profile which asks you preferences and skin types etc, so if you're not a razor fan, there are other hair removal options available. Body pouffe - I don't know how often you're supposed to change these things but I'm happy to have a new one! 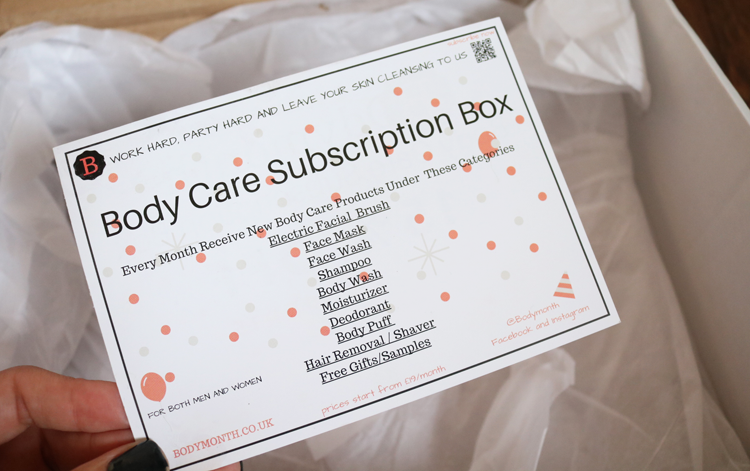 Whilst I wouldn't use everything in this box, I do think that BodyMonth is a great idea for students (maybe the cost could be split between a shared house so there's always some toiletries in the bathroom?! ), large families, and it makes a good care package to send to someone who is perhaps house bound and can't get to the shops easily. That said, many of the brands are often in offer at discounters like Savers, Wilkos etc for £1 a piece, but if you want the added convenience of having everything sent to you, it may well be worth the price. 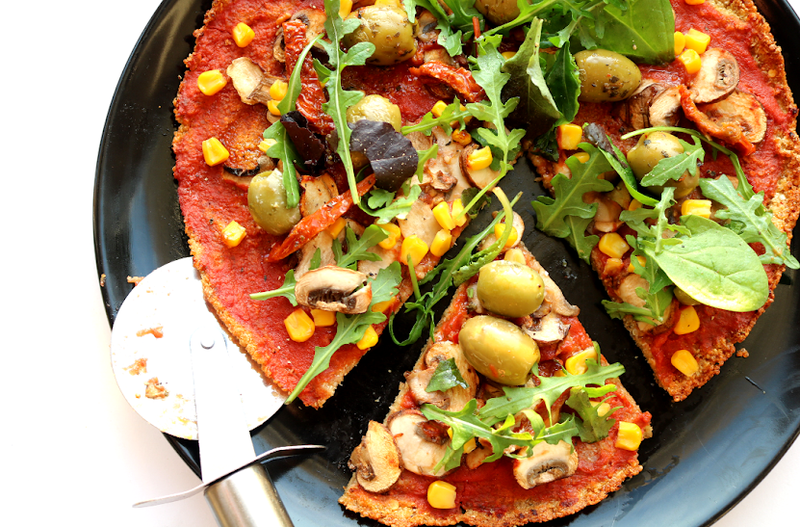 What do you think of BodyMonth? ah this is such a cool idea for a subscription box! thanks for sharing!